The Russian is a villain of the Punisher known for nearly beating him in his first appearance. The Russian was also effectively resurrected and brought back as a cyborg enhanced hit man. In both apperances the Russian was shown to be insanely durable and finally was killed by being tethered to a nuclear bomb. The Russian appeared as a villain in the film "The Punisher" (2004). Quote: "Dosvidanja, Big Boy! The Russian really has to hand it to you!" Final line of the Russian as he was dropped out of a 747 chained to a Nuclear weapon. The Russians origins are mysterious but he is believed to have a connection with Afghanistan. After which he became a mercenary fighting in places including Lebanon, Iraq, Rwanda, East Timor, Chechnya, the Balkans and Belfast. He acquired a large reputation for being both brutal and being nearly unkillable. He is also considered to be a cannibal after eating a man on a bet in Belfast. He is wanted dead by numerous goverment and criminal organizations. After the Punisher has laid waste to the Gnucci crime family the leader of the organization Ma Gnucci sought out the world's top hitmen to kill the Punisher. The Russian accepts a 10 million dollar contrac to kill the Punisher. The Russian boards a plane to Canada where he crashes the plane just above the US border. He leaves the wreckage and slips through the border and heads for NYC. The Russian is picked up by Ma Gnucci's forces and brought directly to the Punisher's home. The Russian enters invades the home and immediatly engages in his a brutal battle with the Punisher. The Russian clearly dominates the beginning parts of the battle however the Punisher manages to gain the upperhand after the pair crash through a wall into his nieghbor's appartment Mr Bumpo. The Punisher burns the Russian's face with a burning hot pizza pan, then throws the very obese Mr Bumpo on top of the Russian. The Russian is temporarily incapitated and the Punisher takes this opportunity to cut off the Russian's head and then use the head to intimidate the remaining forces of Ma Gnucci. Punisher is baddly injured after the bout with the Russian and it is not clear if he could have survived a prolonged battle. Though dead the story of the Russian is not over. The body of the Russian is obtained by a Russian General named Kreigkopf who brings the Russian back to life with various cyborgnetic enhancements. The Russian is given animal organs and metal augmentation. As a result of the hormone treatment the Russian also grows breasts and begins dressing as woman. The Russian's primary desire is to get a rematch vs the Punisher and this request is granted. This time the Russian throws the Punisher off the Empire State Building but the Punisher is saved by Spider-Man. The Punisher uses Spider-Man as a human shield he then uses the webslingers webshooters to knock the Russian off the building. The Russian crashes through the street before being hit and run over by a train. He still survives though is baddly wounded and retreats back to Kreigkopf's base at Grand Nixon Island. Though he survives he is denied his request to go after the Punisher again. Kreigkopf wants to get the Russian away from the Punisher and use him for an attack against the European Union in Brussels. The Punisher continues to hunt the Russian wanting to kill him for good. He tracks the Russian to a Boeing 747 being used to transport him to Europe. The Punisher crashes the plane into Grand Nixon's fuel depot and only the Russian survives this wreck. The Punisher learns that Kreigkopf is planning to drop a nuclear weapon using another airplane. The Punisher tracks down this plane but while he is fighting to gain control of the plane The Russian meets him there. The Punisher shoots out the back of the Russian's head but he still seems to be alive. He then chains him to the nuclear bomb then drops it on top of Kreigkopf's island of Grand Nixon destroying it and the Russian. 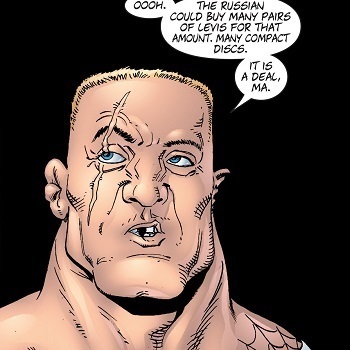 The Russian is one of the toughest physical fighters faced by the Punisher. Insanely high pain tolerance and durability. Is said to survive guns shots to the head and a plane crash. Super Senses - Has smell capability of a blood hound. There are no mentions of The Russian appearing in the MCU at this time. The Russian does appear in the film The Punisher (2004) where he is played by WWF/WCW wrestler Kevin Nash. After a brutal hand to hand battle the Punisher finally gains the upper hand by pouring boiling oil the Russian's face then kicking him down a flight a stairs where he breaks his kneck. 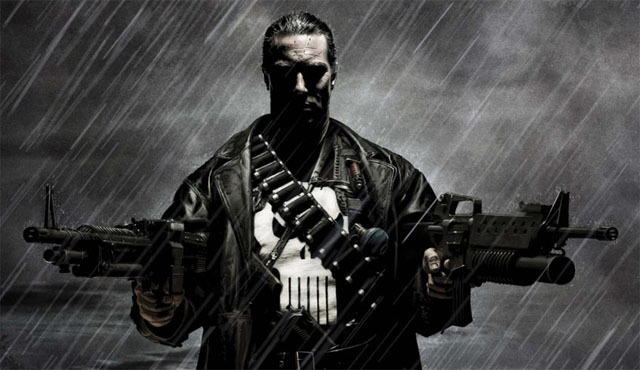 The Punisher is not a film in the MCU.